It can sometimes be easy to overlook just how important CPR and first aid can be, especially in a workplace setting. Although the majority of the time these techniques will not be required, which can lull you into a false sense of security, there is always a chance that somebody could burn themselves, fall down the stairs, have a panic attack or seizure, or suffer from various other dangers and disorders that can occur in the workplace. 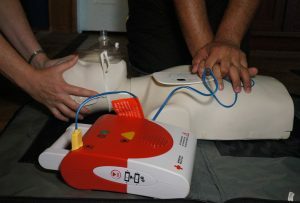 While the average American citizen might make the assumption that CPR and first aid are only required in emergency services positions, the truth is that understanding these techniques are extremely important in any line of work. Earning a security guard certification, for example requires a number of new training and safety courses, including CPR and first aid. Fortunately, these courses are easy to come by if you know where to look. “Some workplaces have greater risks of injury and illness because of the sort of work they do. These risks are important in deciding first aid requirements, because different first aid may be needed for different activities.” Whether you work in an office building or a shopping mall, there is a responsibility to yourself and your fellow man to be able to react at a moment’s notice if somebody were to get injured. As a security guard, this is even more of an important part of the position because sometimes there are dangerous materials and situations which can impede performance and cause distress to all those around you. While seeking out a course in CPR and first aid, it’s crucial that you research each course including whether or not it includes all of the information and hands on experience necessary to properly learn the materials being taught. You should also factor price into which course you will choose. Like so many other programs and courses, much of the training for security guards can be sought on the internet. These online courses give you the ability to complete certification requirements without sacrificing time spent at work or with the family. This can occur, all the while increasing your ability to react in a difficult situation on the job.